For hassle-free travel in between flights, be sure to pre-book a space at one of our exclusive Heathrow Airport Lounges. Available at terminals 1 and 3, our luxury airport lounges offer you the opportunity to relax and recharge before you jet off abroad. Remember to book early and save! If you like the sound of comfortable airport lounges with a homely atmosphere, reserve your seat in one of our luxury lounges to enjoy some "me time" before boarding your plane. For just a small fee, you get to unwind in comfortable seating, while sampling complimentary food and drinks, with a host of other pre-flight entertainment facilities at your fingertips. Don't forget to book your seat in advance and save even more with Essential Travel. 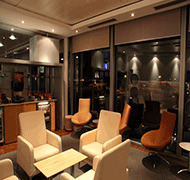 Heathrow airport lounges cater to both business and leisure travellers alike. So regardless of your needs and preferences, there'll be something to make you feel right at home. 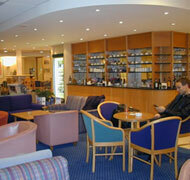 We currently offer the following airport lounges at Heathrow. 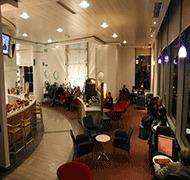 Heathrow Servisair Lounge - Terminal 1: Be treated like a VIP at this classy lounge from Servisair. With all of your mod cons and it's child friendly. Heathrow Servisair Lounge - Terminal 3: A warm welcome will greet passengers using Terminal 3 for European getaways. Expect a high level of service and standards from the staff as Servisair who will get your trip off to a relaxing and friendly start. Heathrow No 1. Lounge (Terminal 3): Get exceptional views of the runway and place activity from this new lounge. Number 1 lounges are well known for their contemporary decor and fantastic facilities. Heathrow terminals 4 & 5 are not currently offered however we are hoping to add Airport Lounges for these terminals into our collection very soon. Airport Lounge Tip: If you'd like to find out more about any particular airport lounge, simply click on the information tab in the quote results. Here you'll find information on facilities and services, as well as directions to the airport lounge at Heathrow.